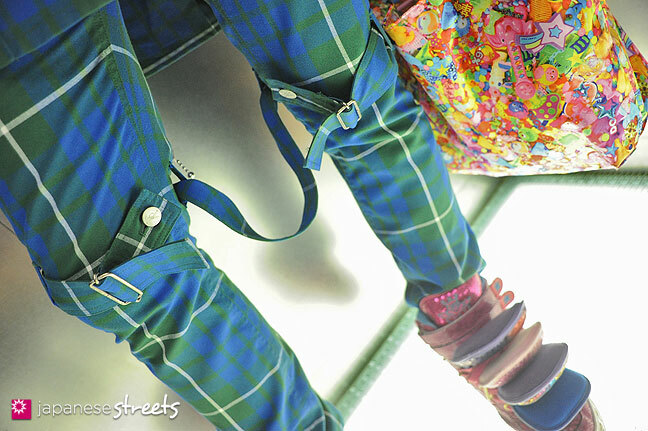 His SuperLovers pants as always awesome. I love that doll! 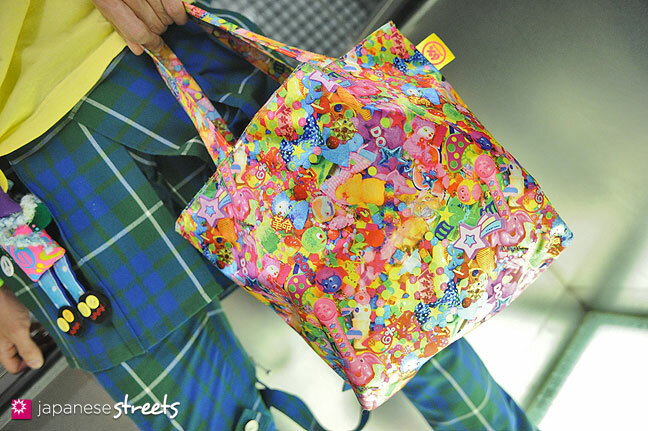 @Amber: Yes, Junnyan has amazing style. 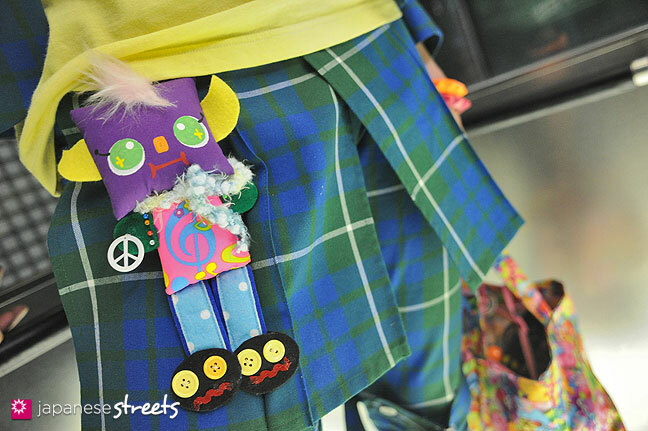 @María: The doll was handmade by a designer, and friend of Junnyan, from Osaka. It’s inspired by Junnyan’s style. @María: Haha, It’s funny that you mention LactoseIntoler-Art. He was actually there when I took these photos. We all had dinner together and then went to see the documentary Bill Cunningham New York. @Maria: On the photo on the bottom can you see the arm on the far right? That’s LactoseIntoler-Art’s arm! 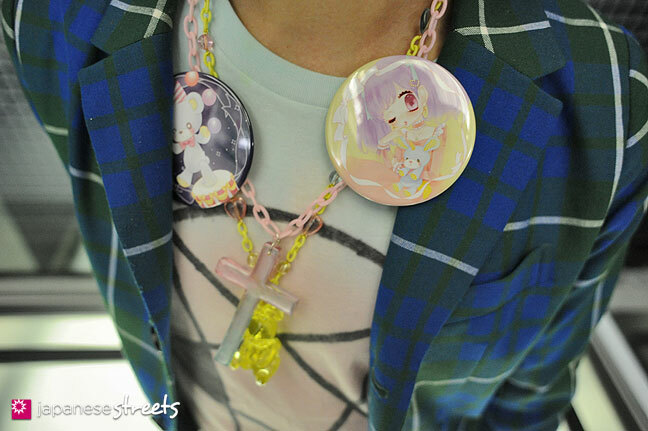 His necklace and bag are absolutely kawaii! 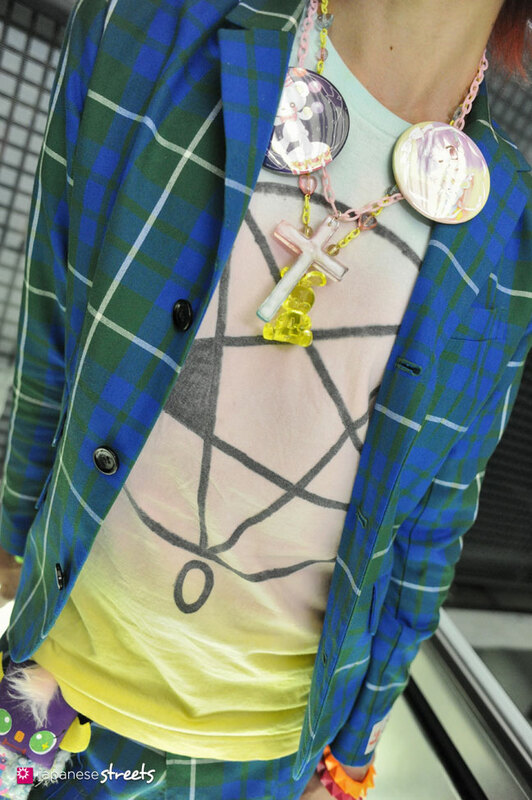 I love the pattern on his jacket and pants! Such a nice color blue and his shirt blends in quite well. I had to take a second look at his shoes! Those are crazy! I have never before seen shoes like that. Multi tongued shoes?? @Marshay: Yes, those shoes are awesome. 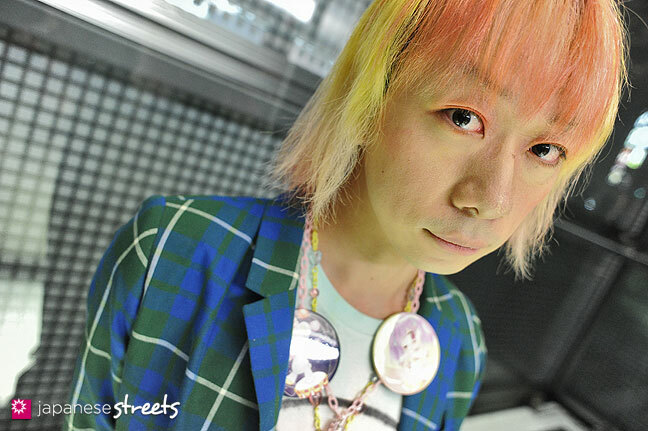 I have shot Japanese street fashion for more than 10 years and Junnyan’s are the only ones I have run into so far. 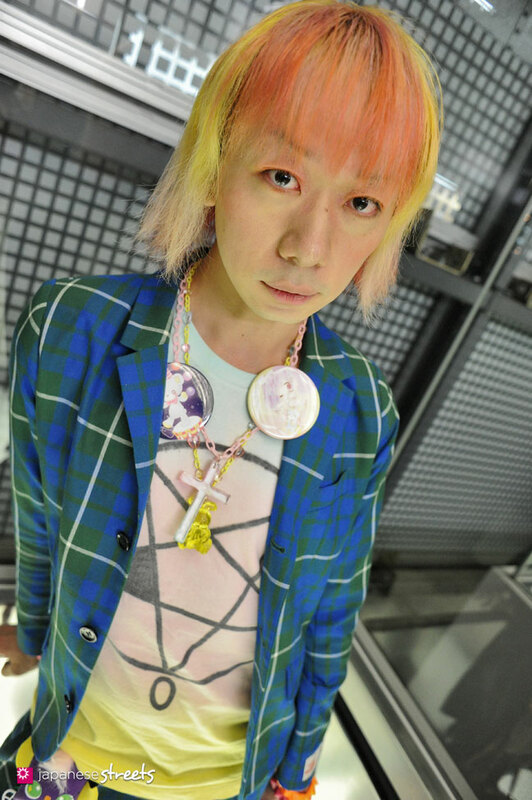 I LOVE Junya’s world – he has always something new to communicate, although his language is always very colorful. The 3rd and 4rth shots are amazing – I love the deep, expressions, and how his hair contrast with the background. 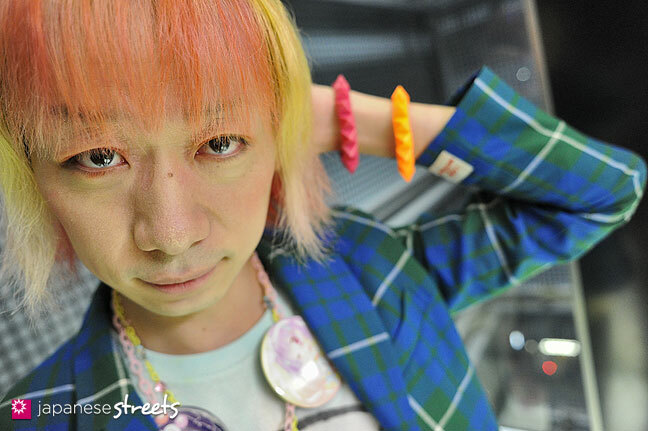 On the 3rd shot it’s also the composition when the bracelets are almost in the center with those eye-catching colors you can’t miss, but still Junya’s face remains as the first plan. @Monik: Thanks for the kind words, Monik! 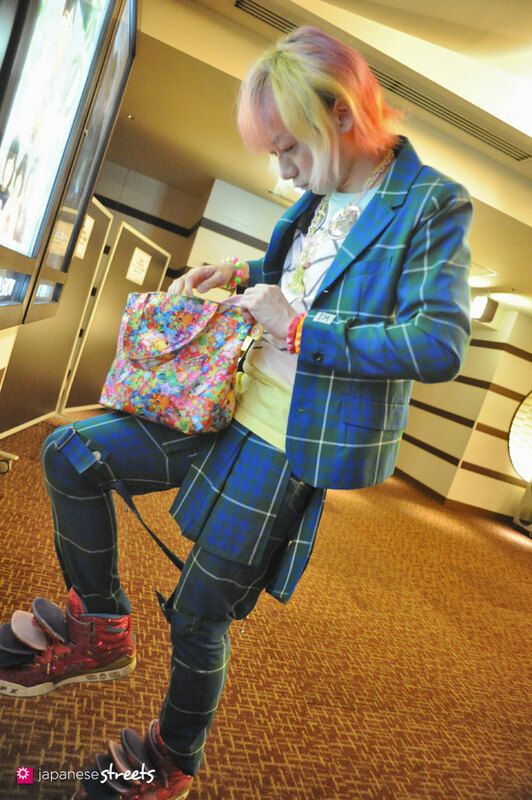 The person in the mirror is actually me sitting on the ground, shooting Junnyan. After we said goodbye to LactoseIntoler-Art, we went into the elevator one more time to shoot some more photos because the light was really good and we both liked the lit up floor. I had actually planned to shoot in the restaurant and the movie theater, but without flash it was just too dark. @Monik: Well, actually there was another person, but after we arrived at the first floor, Junnyan and I decided to shoot a few more images and we went back into the elevator. We had not originally planned to shoot there, but it was such a great location that I grabbed my camera and started to photograph him. i have seen that shoes a couple times .. but i still don’t now what brand are , does anyone know ? @KzZ: The brands (and the prices that the person paid for the item) are introduced below the photos. 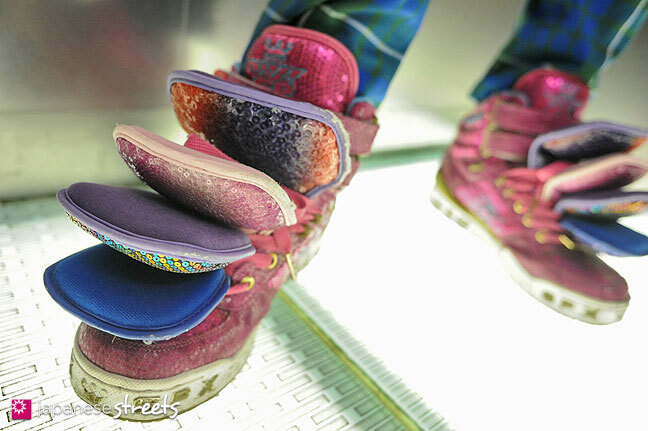 These shoes are by SPX. @Deadly Bite: Junnyan has his own unique style. Impossible to categorize.